We all know that vacations to the Smoky Mountains are a great way to bring members of your family closer together, but have you ever considered the benefits of including the furry members of your family too? You know how you come to the Smoky Mountains to enjoy the fresh air and take a break from everyday life? Your dogs will benefit from the same kind of vacation. Not to mention, they will love all of the new smells and sounds of their new environment. In addition, it’s no secret that pets, especially dogs, are really attached to their owners, and they have a tendency to have a little bit of anxiety when they are separated for long periods of time. Help your dog maintain his or her energetic personality by including him/her on your next family vacation in the Smoky Mountains and staying in a pet friendly cabin in Gatlinburg. As a pet owner, you have probably heard that having a pet around can significantly reduce your stress level. And since one of the main purposes of taking a vacation in the Smoky Mountains is to let go of the stress accumulated from everyday life, why wouldn’t you want to bring your pet along to help you relax? Do you remember that look of excitement in your kids’ eyes the first time they saw the Smoky Mountains? Or do you remember how amazed you were when you first saw the smoky haze rising above the mountain peaks in the distance? You can relive this special memory all over again by bringing your dog to experience the Smokies for the first time. Watching their tail wag and their eyes gleam, you will be reminded of how truly amazing visiting this area is. Pet sitters and boarders can be one of the most expensive added costs to a vacation. Not only do you have to pay for your family’s lodging while you are out of town, but you also have to pay additional for your pets. By combining these prices and choosing to stay in a pet friendly cabin in Gatlinburg or Pigeon Forge, families can save a ton of money and enjoy having their whole family together while on vacation in the Smoky Mountains. If you find out that your favorite Pigeon Forge or Gatlinburg attraction doesn’t allow pets, don’t feel bad. You and your family can use this opportunity to explore the area and find something new to do in the Smoky Mountains that your family loves. 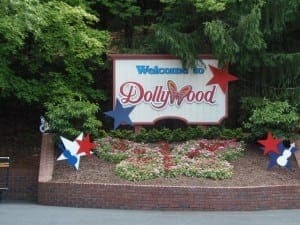 -While you and your family are enjoying all the fun things to do at Dollywood, your dog can have its own adventure at Doggywood. -An open-air mall, owners can stroll around all the store fronts and do a little window shopping with their pets. While you are here, don’t forget to stop into Simply Animals to help your dog pick out its own Smoky Mountain souvenir. -One of the best tubing adventures in the Smoky Mountains, the Smoky Mountain River Rat is perfect for guests wanting to cool down on a hot summer day. This Gatlinburg attraction offers both tubing and kayaking experiences, both of which are pet friendly. -Hours: 10 a.m.- 5 p.m. Unfortunately, there is no way control the weather while you are on vacation. As a result, you and your family may experience a rainy afternoon that pushes back your plans of exploring all the fun things to do in the Smoky Mountains. However, for guests staying in one of our pet friendly Gatlinburg cabins, your afternoon doesn’t have to be a complete wash. Thanks to the company of your child’s furry best friend, your rainy day can easily be transformed from dark and stormy to fun and exciting with a few hours of play time. At Aunt Bug’s Cabin Rentals, we offer a ton of pet friendly cabins in Gatlinburg and Pigeon Forge. These vacation rentals range in size from one bedrooms to eight bedrooms, and can accommodate up to 20 guests under the same roof. Amenities found within these Pigeon Forge and Gatlinburg cabins include bubbling hot tubs, large movie theater rooms, secluded atmosphere, breathtaking views, full-equipped kitchens, and more. To learn more about our pet friendly Gatlinburg cabins, feel free to give us a call at 1-866-697-4581. One of our vacation experts will be more than happy to answer any and all questions you may have.